For the first time ever, the new iPhone sticks with a mostly familiar design for a third year running. But despite that exterior sameness, Apple makes a gutsy gamble on improving, and completely removing, core features that have been part of the iPhone for nearly a decade. And yeah, it also comes in glossy black. For better or worse, this is the 2016 iPhone. As is tradition, Jony Ive delivered a wonderfully psychotic video to introduce the new iPhone, focusing on the new gloss finish and the redesigned camera housing. Apple’s Phil Schiller then ran down all the changes live on stage. At 7.1mm, the iPhone 7 is actually the same thickness as the iPhone 6s. First up was design, Schiller confirmed what we already knew. Space Grey is out and Black is in. Apple also completely redesigned the home button, which has been the sole navigational key on the iPhone since 2007. Schiller says the new button is more reliable and customizable. And thanks to a new generation taptic engine, the button is now Force Touch sensitive. The new generation of the tech now provides unique feedback for messages, notifications, and ringtones. Apple was a little vague exactly how this all works, but we’ll know more soon. And a much needed feature is also here—the iPhone is now toilet proof. Apple says its re-engineered the casing so that the phone can survive most H20 plunges. And many accident-prone people rejoiced. Apple focused heavily on remaking the two camera systems in the iPhone 7 and iPhone 7 Plus. Each phone now comes with optical image stabilization and an f/1.8 aperture lens for muuuuch better low-light photography (hopefully). Apple also reworked the flash to make it brighter and able to capture truer tones and its image processor for better editing. With iOS 10, you can finally capture RAW photos and the front-facing camera comes with a 7-megapixel sensor, an upgrade from 5 megapixels on the iPhone 6s. Finally, Schiller gets to the much-anticipated dual cameras on the iPhone 7 Plus. It turns out one is a normal lens and the other a telephoto lens. Schiller explains that this new camera system can build a zoom feature into the iPhone. When in the camera app, a new button can zoom 2x instantly with just a tap. After 2x, however, further zoom relies on software. But because of the added telephoto lens, the zoomed in images are much clearer than before. Like the iPhone 6s the iPhone 7 can shoot in 4k at 30 fps, refuting some rumors suggesting that Apple might up the frame rate to 60. Oh well. As you’ve likely guessed, Apple is sticking with an LCD Retina display, though much like the Apple Watch Series 2, it’s a much brighter display. Then finally, Schiller got to the giant elephant in the room—audio. Apple couched the impending bad news by first talking about improved stereo speakers. Then came the Lightning-only EarPods. Goodbye, headphone jack. Schiller made certain we knew that there were over 900 million Lightning-connected devices from companies like JBL. But what if I wanted to use my headphones on, say, not an iPhone 7. Luckily, Apple will be including an audio jack adaptor in every box for the iPhone 7. Get prepared to lose it! Schiller says this is all possible because of a new chip called the W1. The AirPods can be set up so one pod answers calls or summons Siri and the sound is intelligently routed to the right ear when needed. In addition to the AirPods, Beats will also use the W1 chip in the new Beats Solo Wireless, Powerbeats 3 Wireless, and a new line called Beats X. The AirPods will be available in late October, starting at $160. These are NOT coming in the box. Finally, Schiller closed up things with the new A10 Fusion chip. It’s a 64-bit quad-core processor. Two cores are high-performance, so they can run 40 percent faster than the chip on the iPhone 6s and twice as fast as the chip the iPhone 6. If you want to keep playing this game, it’s 120 times faster than the original 2007 iPhone. The other cores are “high-efficiency” to handle lighter applications for better battery life. The new graphics chip is also 50 percent faster than the iPhone 6s. Schiller says you can get LTE browsing on the iPhone 7 and 7 Plus at 12 and 13 hours respectively, which is around 2 hours better than the iPhone 6s. Not bad. Of course, these are all just numbers. Hopefully these impressive specs and curated demos translate to actually impressive real-world use. 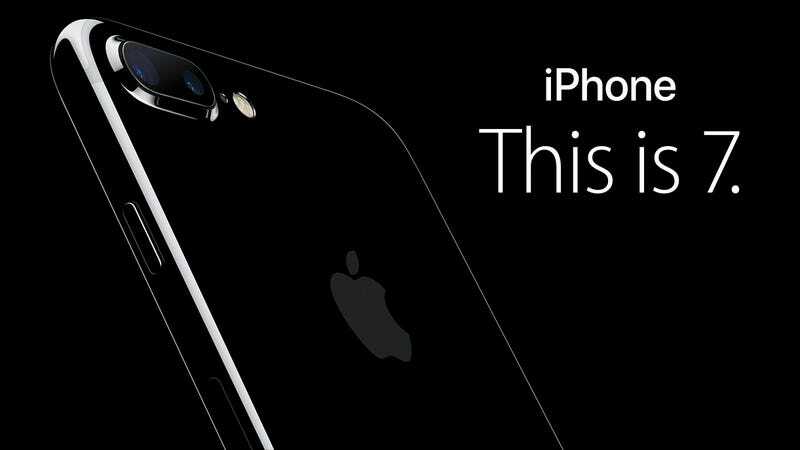 The iPhone 7 and 7 Plus will arrive at the same price as the iPhone 6S, starting at $650 and $770. Apple has also doubled the storage at each price point, starting with 32GB and going all the way to 256GB. Even old iPhone 6s models will get the storage upgrades. Orders start this Friday on September 9th and will arrive on September 16th. iOS 10 will be pushed out to all devices on September 13.